I want to start this review out with a confession. I will watch virtually any movie you put in front of me that has to do with Partition and the myriad of problems that stemmed from it, especially those involving the mystical vale of Kashmir. It's been an obsession of mine ever since I read the book 'Freedom at Midnight' and even though I have lived in the US for most of my life - the subject remains very dear to my heart. I have close friends from both sides of the border and have written a past post on the subject as well. 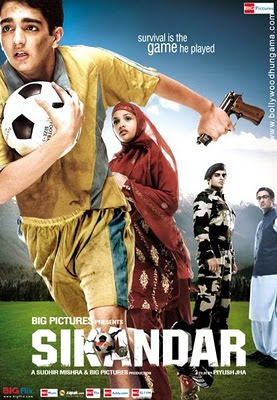 So when I heard about the movie 'Sikandar' I was immediately drawn to it for it's catchy songs as well as it's subject matter. Sadly though, this movie was just a mess. The first half explored the basic themes of movies of this sort - violence undertaken for the sake of freedom, religious extremism, children caught in this cycle of hate, etc. The story centers around Sikandar - a 14 y.o. Muslim boy who has been orphaned by the jihaadi movement in Kashmir who now lives with his aunt and uncle. One day he finds a gun and the events that stem from that fateful discovery are what make up the bulk of the movie. The director really tries in earnest to point out how complex this problem is and how the solution to it's resolution will not be easy. But he does it in such a confusing and ultimately uninteresting way that his efforts go in vain. There are many better Partition movies out there including 'Pinjar', 'Parzania' and the 1975 National Award winner 'Garam Hawa' (review coming soon). Not everything was bad about the movie. The actress who played Sikandar's best friend Nasreen (Ayesha Kapoor) was a joy to watch and the scenery was simply spectacular. Not sure if they shot the movie on location but seeing Kashmir is definitely on my bucket list of things to do. And last but not least, a cute little number that is the song of the week - Chaal Apni by Hrishikesh Kamerkar & Hamsika Iyer. Thanks for this post, Sanket. I haven't seen Sikandar, and your post kind of validates keeping it that way. Absolutely share your views on films of this theme. Saw Tahaan (2008) a few months ago (it's shot on location, and is mighty breathtaking cinematographically), and would highly recommend it, as I would Ramchand Pakistani (2008). I'll look forward to your post on the fantastic Garam Hawa! Freedom at Midnight is my fav book too. but yes, the movie was disappointing. Agree with tBF here, 'must' watch Tahaan. I lost interest within 30-40 min into this movie. And, I agree with Bollywood Fan about Tahaan and Ramchand Pakistani...both were really good. You must also watch "Firaaq" if you haven't yet, it's based on the Gujrat riots. Darshit - Glad to see another fan of 'Freedom at Midnight' and will definitely check out Tahaan after 2 recommendations. I lost interest in this movie within 30 min. I agree with Bollywood Fan, you must watch Ramchand Pakistani and Tahaan. Also, have u seen Firaaq yet? Really good movie on Gujrat riots directed by Nandita Das.